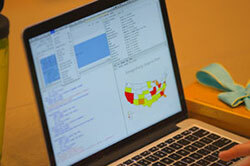 Each year, the ASA DataFest Core searches for data that have a personal aspect and are large, complex, and intriguing. It is important for students to know someone is listening, so the data should be associated with an appeal by its owners, who communicate with the students in person or on video about what makes these data special and what the organization is hoping to learn from the data. Data can be proprietary (in the past, students have signed nondisclosures), but it should be understood that tight control isn't possible and, generally, students are encouraged to share their findings with the world at large. You can visit your local ASA DataFest for a few hours as a roving consultant. Roving consultants wander the room asking questions of the teams and answering questions. Many teams need guidance regarding strategies or analysis methods. Sometimes, they simply need someone to serve as a sounding board (which is the most common role). Some consultants have found this to be an excellent way of recruiting future employees, and, universally, the consultants find the interaction fun. To find out how your company or organization can become an official sponsor of ASA DataFest, contact Amanda Malloy, ASA Director of Development at amanda@amstat.org.